Updating a bathroom doesn’t mean having to start from scratch. There are always attractive additions that can be made and often a space can be enlivened by changing only one or two things. DécorPlanet is happy to provide these five simple suggestions that can update the look and feel of your bathroom in mere hours. Replace or add accent tiles to the walls. 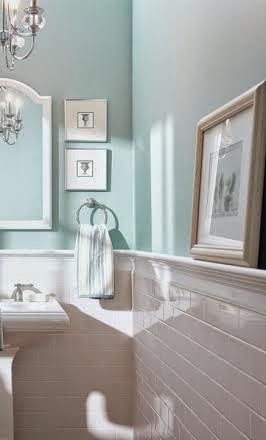 Tiling an entire wall or just adding accents is a cost effective way to produce a sleek appearance. This type of project can often be completed in a single weekend. Add a stylish medicine or linen cabinet. Adding cabinetry or a mirror is much simpler than working with fixtures that require plumbing or electrical work. But these little additions can greatly enhance both the style and convenience to your space. Change wall décor. Add wallpaper, repaint, or place sconces on walls to give new life to your bathroom. Changing ceiling lighting and other fixtures can help walls pop as well. Change fabrics. Changing shower curtains and adding fabric covers to furniture are both inexpensive and easy ways to update your bathroom décor. If your bathroom furniture is not upholstered, try placing stylish towels on a chair instead of in a cabinet to provide additional color and a spa-like feel. Theme it out. If your bathroom is stylistically anarchistic, try choosing one theme and sticking to it. You can create any feeling you want, from classic to exotic and everything in between with just a little planning and a small amount of time. As a weekend project or spaced out over a few weekday nights, these simple bathroom updates can provide new life in next to no time at all. Better yet, requiring minimal effort and cost, these updates are often all it takes to make your washroom one of the most inviting and exciting spaces in your home.